Amazing Blades Landscaping specialists in home and commercial landscaping and lawn maintenance knows better than anyone what great exercise yard work can be. Exert yourself enough and you'll see and feel those calories and inches burn away. But for some, lawn care and gardening season means the arrival of those annoying spring allergies. You know, the ones with watery eyes, runny noses, sniffling, sneezing, stuffy heads, and those dreaded pressure headaches. Blame the pollen. When plants begin throwing pollen, allergy sufferers begin looking for relief, or even staying inside. One of the worst culprits is the infamous ragweed, according to an article from the Clemson Extension Service. 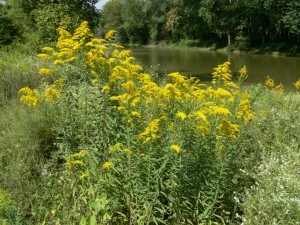 Across the South, the goldenrod, South Carolina's state wildflower, gets much of the blame for allergy suffering because of the similarities in the two flowers, and they both flower at about the same time. The Extension Service recommends removal of ragweed from your property when it is first noticed and before it begins making pollen. For expert help in removing ragweed or other nuisance plants from your lawn or property, contact the experts at Amazing Blades Landscaping. One of the most authoritative and respected consumer health websites, WedMD.com, hosts a great article titled "Gardening with Allergies" that gives 21 gardening and landscaping tips perfect for South Carolina homeowners. Trust us, it will be worth a few minutes' reading, especially if you are an allergy sufferer. Cacti - About the only thing you have to remember about cacti is that they donâ€™t do well in frigid temperatures, but are otherwise easy-care plants. Oh, and theyâ€™re virtually pollen free. Roses and bulbs - These flowers will bring tons of color to your South Carolina landscape without the overbearing pollen. And they are largely care-free plants. Trees - Choose male trees if you go with oaks and maples. Or choose fruit trees (apple and cherry, for example) and dogwoods as good options. They have small flowers, and small flowers mean less pollen. Amazing Blades Landscaping wants you to enjoy your yard as much as we enjoy maintaining it. Consult with our South Carolina landscape specialists at 843-652-5296 for a free estimate on creating the perfect home landscaping or commercial landscaping for those who suffer from pollen allergies.